A constant conversation in the life of an adoptive mom, Nature vs. Nurture. While my mom is fond of calling my Korean-adoptee daughter, Molly, “Little Jodi” there are definitely ways in which her Nature shows itself to be nothing of sort. Her Nurture? Ahh, that is another matter all together! I am blogging this morning to share the evidence of Molly’s having inherited my love of (and world reknowned skills for) cooking and the resulting Martha-Doesn’t-Live-Here treats. You thought you were viewing a delicious sugar cookie in the first photo, didn’t you? Well…. you were. Sort of. 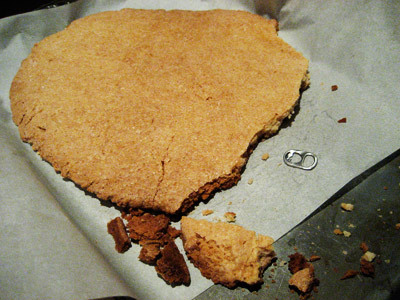 But if you view the second picture above you will see from the skillfully placed pop-top (for scale) that it is really a GIANT SINGULAR cookie, made from the batter of a recipe for baking 3-4 dozen cookies! Ahhh, Molly. 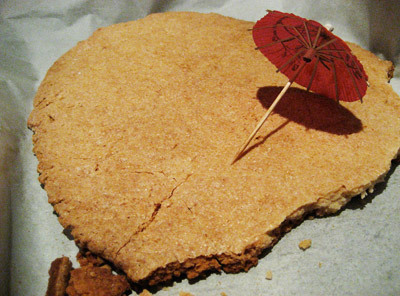 The thing is… as we were discussing just how we might break up the super-sized hard-as-brick cookie into tiny crumbs in order to feed the poor blizzard-stranded birdies in our yard… we began eating it and lo, it tastes GREAT! Watch your crowns and other expensive dentistry… this is a very (very! 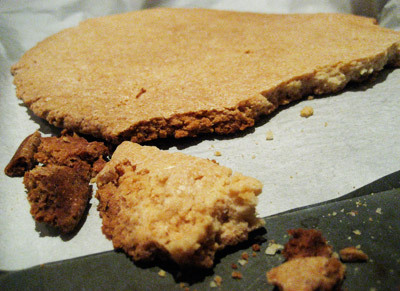 ), um CRUNCHY cookie… but it is actually quite delicious. Sorry birdies. To Molly, and her friend Jenny’s credit, the above pictured brownie-cupcake weapons were also created in the same 24 hour snowbound period. These too are rather… um, crunchy. 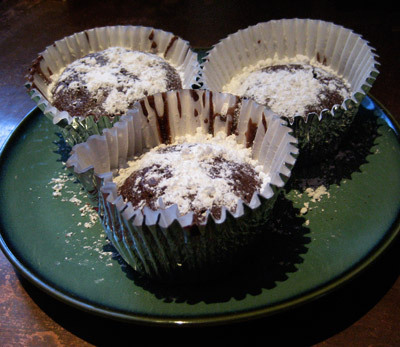 However… 20 seconds in the microwave renders them warm, soft, chocolately, and (surprise!) possessing of a rich “lava” center. Great with coffee the morning after the big snow storm of 2009. Thanks, my little nurtured girl.